We have recently moved to our new bungalow and the patio was in a terrible state, the walls were filthy too. 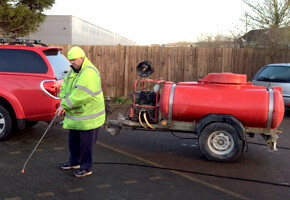 Cleansheen has transformed the look dramatically with their jet washing. I found them very obliging, excellent job. Your property is under constant attack from the Bristol weather and invasive plants like algae, lichen and moss. Using power washing Cleansheen gives the surroundings of your home a sparkling makeover. Patios and decking look terrific when they are new. They don't look so good when they are covered in dirty green slime. Worse still, this coating damages surfaces and makes them dangerously slippery on a wet Bristol day. 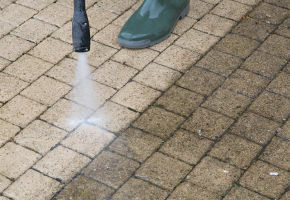 Cleansheen’s patio cleaning methods solve these problems at a stroke. Jet washing removes all traces of grime and algae, leaving your patio and decking in spotless condition. Moss and weeds on driveways and paths give your property an unkempt, neglected appearance, made worse by the dirt and stains that accumulate through daily wear and tear. Cleansheen’s highly effective driveway cleaning gets rid of invasive vegetation and unsightly marks, allowing the natural colours of your paving to come alive again. 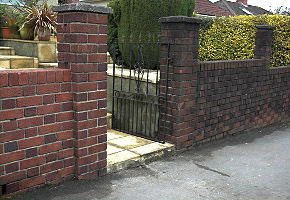 The same powerful washing techniques can be applied to your walls and fencing. Why not brighten up your entire exterior?